The staff at Wellscroft Fence Systems will prepare one free estimate of your permanent or semi-permanent fencing materials. Modifications and additional estimates may be subject to a fee. These fees are due prior to working on the estimate. For orders that are placed within 30 days of the estimate any fee will be applied to the order. We invite you to visit our farm so we can show you the different types of installation available and help you to design your fence. If you are unable to visit us, e-mail, fax or mail us a map of the area to be fenced. It can be a rough drawing but should include the information outlined below. 1. Measure distances to the nearest 25’, and total the perimeter to be fenced. A line drawing is better than an aerial photograph. 2. Note any slight and/or major changes in direction. High-tensile fence requires a brace assembly, tree or substantial post(s) around which to bend. 3. Indicate available trees to use at corners,gateways, or the end of fence instead of brace assemblies. Note: Wellscroft always recommends attaching the fence to a board which is first nailed onto the tree. 4. Mark where gates are to be located, and what type, height and width. What is the widest gate needed for future work on the area? How frequently is the gate used? For game gates, do they need a small walk-thru door for people? Note: Wherever possible, locate gates in corners to eliminate one brace assembly and ease the flow of livestock from a pasture. 5. Does the gate need to be electrified? If two or more gates exist in the fence, an insulated wire will need to be buried in PVC pipe under each gate. 6. Note dips, hills, and streams that may necessitate earth anchors, anti-sink measures, water gaps, or a substantial line post/tree. 7. Note location and type of the following: energizer (battery, solar or plug-in), source of electricity, lightning protection, and energizer ground field. 8. With a dotted line, indicate location of semipermanent subdivisions and connection points to outer fences for rotational grazing. 9. Indicate location of houses, barns, utility grounds, buried water lines, septic systems, roads, streams, stonewalls, ledge, steep terrain and wet lands. 10. What types of posts are to be used? Pressure treated, cedar, fiberglass, steel T-posts, pipe, or something else? 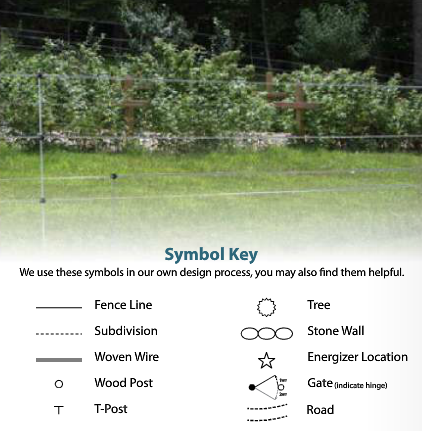 What fence posts and/or fence material do you already have on hand (telephone poles, locust posts, or trees)? Will the fence need to follow any regulations to be installed on a certified organic farm? 11. What is your soil like? Is there ledge? Is it sandy? Is it wet? Is it rocky? 12. Is the fence line cleared, or will you have to hire someone to clear it? Note: If there are stonewalls, it is best to build the high-tensile fence right next to or 15’ into the woods side of it, so livestock can keep the wall clear of brush. 13. What are your expansion plans for the next five years? 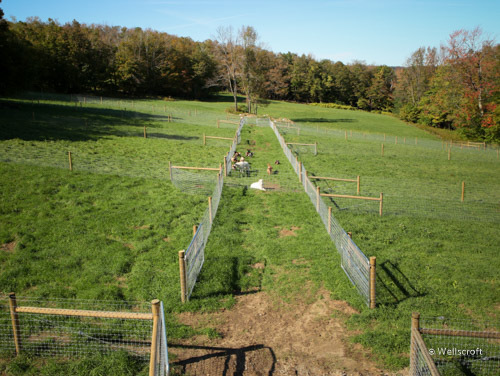 Do you plan to increase the number of types of animals, the number of acres fenced? You will initially want to purchase a powerful enough energizer to run any expanded fence. 14. In multi-animal situations, what kind of fence will serve all your needs, both now and in the future? 15. Due to the snow’s insulating properties, how will winter affect your need for fence and its effectiveness? If you are planning an electric fence system, will the polarity need to be switched for better exclusion of wildlife or grounding of livestock? 16. Be sure to indicate north on the map. When a permanent fence is not needed or isn’t feasible, there are many ways to achieve one’s goals using materials that can be set up and taken down once a day or once every few years. Semi-permanent fence includes electric netting and any conductor that can be wound up on a reel for storage. It is quick to install because lightweight posts are used and very rarely is a wood post needed. 1. How long will the semi-permanent fence need to last? 2. How often will it be moved? Will this be done with reels or net? 3. Does it need to be used in the winter? 4. Will it be visible to both predators and livestock? 5. What is the animal/predator pressure? 6. How many and what type of gates will be used? 7. Will it need a solar or battery energizer because it is away from a power source? 8. Does the conductor have the conductivity to do the job? Will it be able to power up other fences? 9. What type is the most efficient use of lanes? 10. Can trees with a board attached be used as posts?